In the article the appealing of gold as the long-term asset of investments is discussed. Particularly it is shown that the 10-years average for the gold yield well correlates with the current real earnings yield (reciprocal of the P/E ratio). So in the phase of earnings multiple expansions, when the market's growth essentially outstrips the earnings growth, the average gold yield tends to fall down. And vice versa, when the earnings multiple is in the phase of contraction, the market participants tend to pick up gold that leads to growth of the gold yield. To make the strategic asset allocation it is necessary to evaluate the long-term yield, which could bring investments in one or another asset class. Historically the major assets are stocks, bonds, commodities and cash. One of the important advantages of investing in the corporate sector is the active position of companies. It implies that company managers aim for development of business, which should lead to earnings growth. Thus we can consider the stock market as a black box that generates earnings. Nevertheless, the investment in stocks brings a number of risks as well. So, an investor has to pay for this money generating black box. It can turn out that investing money occurs in the time of the long-term bear or sideways market. In this case the investor should hold on positions in stocks for many years to return the invested money. Government bonds are the risk-free assets (not considering the case of default). But the bonds yield, as in present, can be too low to satisfy duly a long-term investor. The cash is very safe asset, but inflation constantly decreases its real cost. Historically gold is one of the basic assets of investment for private persons and corporate investors. At the first glance gold bullion looks like a passive element. For example, it could not increase in weight by itself and the chemical formula of gold is unchangeable for ages. Stability is the great advantage. Thus, stability should has cost. The price of gold is in the up trend since April 2001 (see Figure 1, left scale) and grew by December 2004 on 69 % (from 260 up to 439). In average, using simple percents for calculations, it makes 19 % annually. At the same time S&P 500 (see Figure 1, right scale) fell by 1.3% (from 1190 up to 1174). Nevertheless the cyclical bull trend, which started in February 2002, allowed growing the S&P 500 by 38.4% (from 848 up to 1174) by December 2004. The 10-Y Treasury bond yield fell since April 2001 (see Figure 2, right scale) by December 2004 from 5.14% up to 4.36%. So the change of bond's price was insufficient to satisfy investors. Market participants should evaluate priorities of investment in different classes of assets. Accordingly it is important to understand the asset appealing in long-term prospect. In my recent papers ,  the valuation of the equity market was discussed. Particularly it was found out that the reciprocal of the P/E ratio or current real earnings yield (CREY) is tightly correlated with both the 10-Y Treasury bond yield (TBY) and the 10-year average for the CRB Index yield (CRBY) (where CRB Index yield is the one-year change in the price of index). It demonstrates close interrelation of the different assets. On the other hand the king of metals - gold correlates well with the CRB Index . 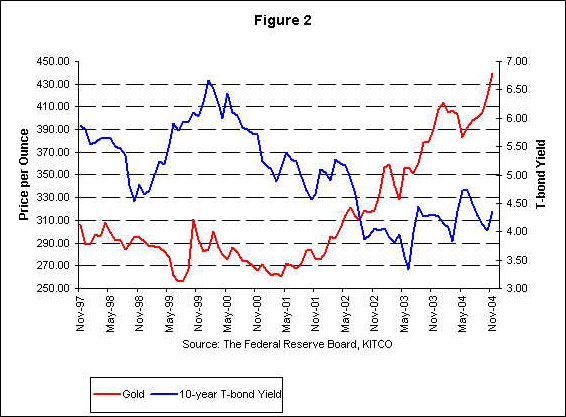 By analogy with the CRB Index yield it is possible to introduce the concept of the gold yield. Let's stand the one-year change in the price of gold for the gold yield. Therefore as in the case with the CRB Index yield it is necessary to average the value of the gold yield for 10 years. Then the 10-year average for the gold yield (AGY) shows the attractiveness of investments in gold for long-term investors. I decided to check if there is any correlation between AGY and CREY. Data for 100 quarters since September 1979 till July 2004 are used. It appeared that the 10-year average gold yield tends to correlate closely with CREY (see Table 1, Figure 3). Particularly, the correlation coefficient R-squared is equal to 78%. 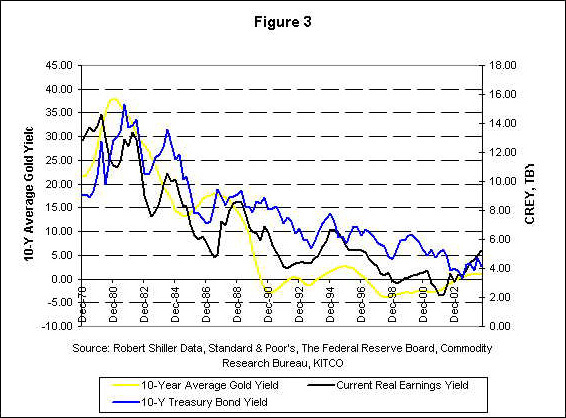 Thus in the bull trend of the equity market, when P/E ratio tends to rise, the average gold yield tends to fall. The era of 80-th and 90-th was marked by the high market growth rate  and moderate earnings growth rate. Accordingly the CREY was falling. At the same time commodities market in general and precious metals market in particular were stagnated. The possibility to earn big money in the corporate sector (including both the direct investments in the companies and playing on the market) attracted the capital. As it is shown the 10-year average for gold yield well correlates with CREY (reciprocal of the P/E ratio). Thus the future movement of AGY depends on CREY. In  I discussed the reasons that could lead to CREY growth. Particularly, both the 10-Y Treasury bond yield and the 10-year average for the CRB Index yield are expected to grow. Therefore the gold yield is expected to grow as well. I think, that both the 10-Y Treasury bond yield and CREY will grow up to 6 % (accordingly P/E will be lowered up to 16). I expect that when the CREY and TBY grows the stock market stays in sideways movement and the bonds price fall down. On the other hand the growing CREY and TBY could lead to further growth of the average gold yield. From the beginning of 90-th AGY has being stayed around zero level. The current value of the 10-year average for the gold yield is approximately 1.2%. In my opinion the yield of investments in gold in coming years of this decade should be 6% at least. Considering long-term investments one should also pay attention to the corresponding risks. One of the well-known tools for market risk measurements is the Value at Risk method . The Value at Risk for a portfolio is the maximal loss (or worst loss) that can occur under normal market condition over a target horizon within a given confidence interval. It is well known that Value at Risk measurement is based on two quantitative parameters: the confidence level and the horizon. The choice of these parameters depends on the certain application. Suppose a hedge fund invests $ 100 millions in gold. What could be the potential loses of the hedge fund in month? 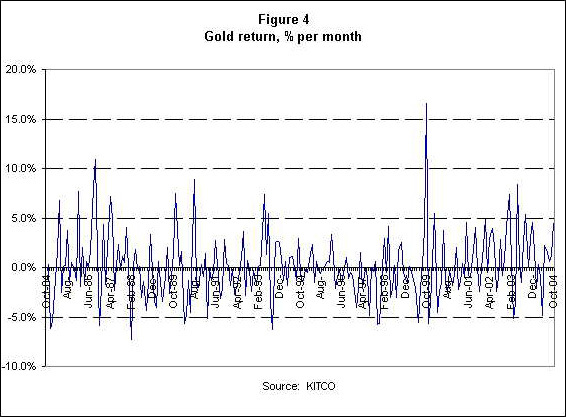 To answer this question I analyzed the data on monthly gold return since October 1984 to October 2004 (Figure 4). Data for 240 months are analyzed during this period. It evident from Figure 4 that the gold return is in the range from -7.24% up to +16.55%. 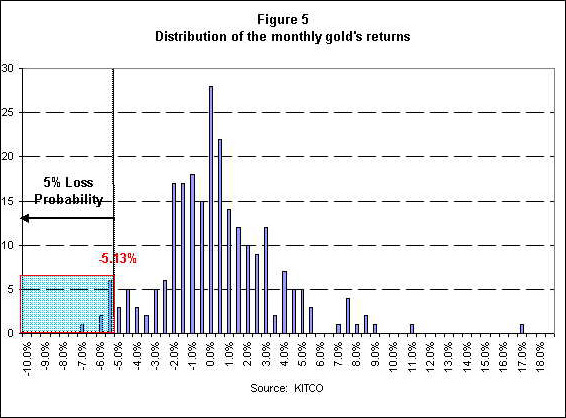 Let's analyze the distribution of monthly gold return (Figure 5). For 95% confidence level we can find the value is corresponding to 5% probability to have lower return. In this case this value is equal to -5.13%. Thus all events when gold return is lower than -5.13% are observed in 5% cases or 12 months from 240. Let us calculate the Value-at-Risk for the $100 million portfolio of gold and stocks (for example S&P 500 index). 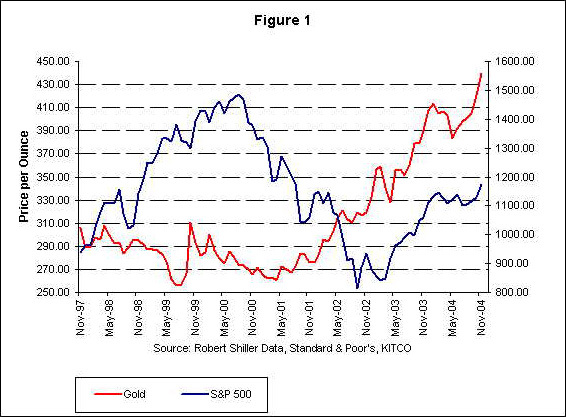 Suppose that investments in gold and stocks are equal. VaR1 (Gold) = 5.13% * $ 50 millions. = $ 2.56 millions. Similarly, let us analyze distribution for the monthly returns for S&P 500 investments (without dividend yield). Calculations show that for 95% confidence level the lower return is equal to -5.31% for the 5% probability. This value does not differ a lot from the similar value for gold (-5.13%). Then to evaluate the Value-at-Risk for the whole portfolio it is necessary to find the correlation coefficient between monthly returns for gold and stocks. Calculations give that this coefficient is negative and equal to (-0.23). VaR = = $ 3.24 millions. It is shown that the 10-year average for the gold yield correlates with the current real earnings yield (reciprocal of the P/E ratio) well. So market participants tend to neglect commodities in general and gold in particular during the phase of the earnings multiple expansion. And vice versa, when the earnings multiple is in the phase of contraction, the market participants tend to pick up gold that leads to growth of the gold yield. As it was mentioned above there are some reasons leading to growth of the Treasury bond yield and current real earnings yield. Therefore the gold yield grows as well. In my opinion the yield of investments in gold in coming years of this decade will be at least 6%. Thus gold is very the attractive asset for long-term investments. The portfolio with correctly picked on composition of gold and stocks allows to reduce the total portfolio risk noticeably.